Great news for all the Apple’s iPhone users! The famous Facebook application for iPhone has just been upgraded and released to App Store yesterday. Besides usual bug fixes, the new v2 release will bring together some great features as well as a totally fresh new user interface intended to bring more fun and convenience to all iPhone users. As a second major release from Facebook, the upgrade basically covers what had been left out from the initial release. One of the major improvements is on the message attachment issue that was not included during the initial release back to version 1.1. Besides, photo uploading functions has been enhanced with tagging, captioning and even posting to walls that make this mobile application more convenience from iPhone. That is not all, users will able to do friend requesting or people searching in easy way through the friendly GUI. Most importantly, couple of bugs fixes will definitely help improve the software stability, making the photo uploading faster and more stable with greater user experience. This upgrade version will definitely able to attract more iPhone users to have one installed in their devices. 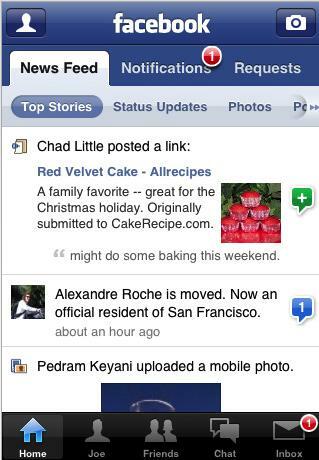 By now, mobile users will have pretty similar functions just like what can be done by Facebook in desktop version. Since it is free, just get a download at Apple iTune for quick trial today.